Concord, Massachusetts is known for many things, most notably for being at the heart of the American Revolution, but there is more to the quaint New England town than just that. Concord is also home to American Bloomsbury, a group of writers, philosophers, and revolutionists; two members of which were the Fathers of the Transcendental movement of the 19th century: Ralph Waldo Emerson and Henry David Thoreau. Both authors, spanning their writing careers, produced some of the most influential American Literature that is still studied in university courses today. In Emerson's famous essay "Nature" he proclaims "a man needs to retire as much from his chamber as from society" and that "When I behold a rich landscape, it is less to my purpose to recite correctly the order and superposition of the strata, than to know why all thought of multitude is lost in a tranquil sense of unity." Much like many of his essays, as with Thoreau's, the focal point lies in reconnecting the human spirit with nature. To do this, both Emerson and Thoreau would spend hours wandering the uncharted woods of Concord forging their own paths. Thanks to a recent project undertaken by the Town of Concord, the Trails Committee, the Emerson family, the Mill Brook Task Force, and many volunteers, one known path has been restored for all to enjoy. 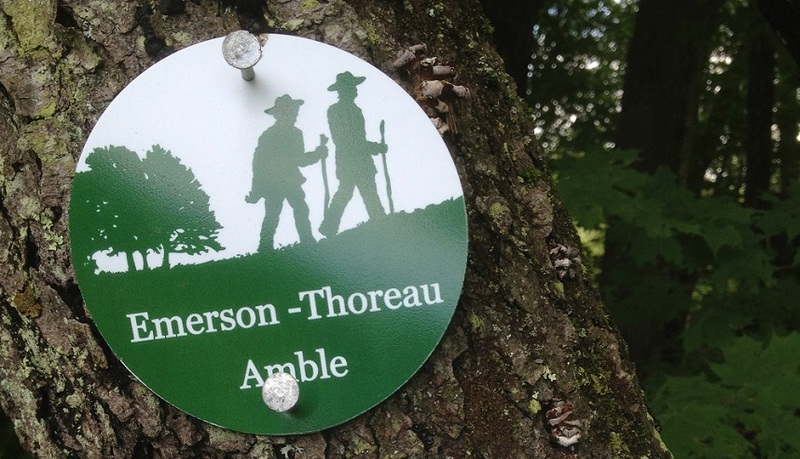 On Friday, June 14, 2013, a grand opening was held for the newly finished Emerson-Thoreau Amble that begins at Heywood Meadow and stretches to the location where Thoreau's cabin was sited at Walden Pond. Curving and cutting through woods, wetlands, and fields, the Amble follows the same path both famous authors frequented, sometimes together, with notable points of interest along the way, including the recently refurbished Gun House, Emerson's House, and the Concord Museum, just to name a few. Although the path has already been forged, the Amble still has a certain allure. With each step forward one is thrust backwards into the time of Emerson and Thoreau, when walking wasn't for fitness, but for leisure and a way to find oneself among nature. Keeping in mind how times have changed, how in the current epoch people have information at the tips of their fingers, this path can hopefully serve as a way for us to return to our roots. To once again, take an intrinsic act and walk, not into the future, but into oneself.